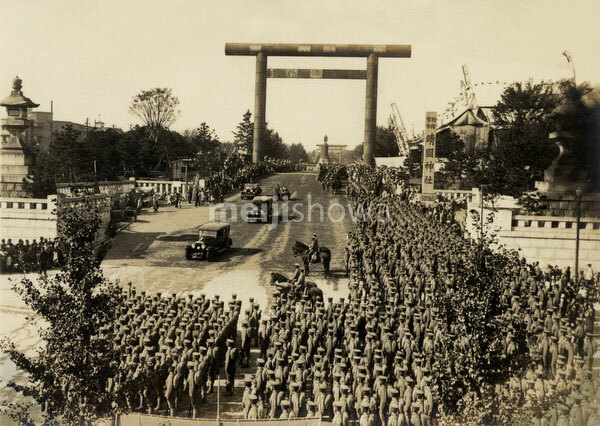 Troops of the Japanese Imperial Forces are lined up at Yasukuni Shinto Shrine (靖国神社), Kudan (九段), Tokyo. The shrine was established on June 29, 1869 (Meiji 2) to commemorate the Imperial soldiers who died in the Boshin War (戊辰戦争, Boshin Senso). It was initially called Shokonsha (招魂社), but renamed Yasukuni Jinja on June 4, 1879 (Meiji 12). The torii dates from December 31, 1887 (Meiji 20).